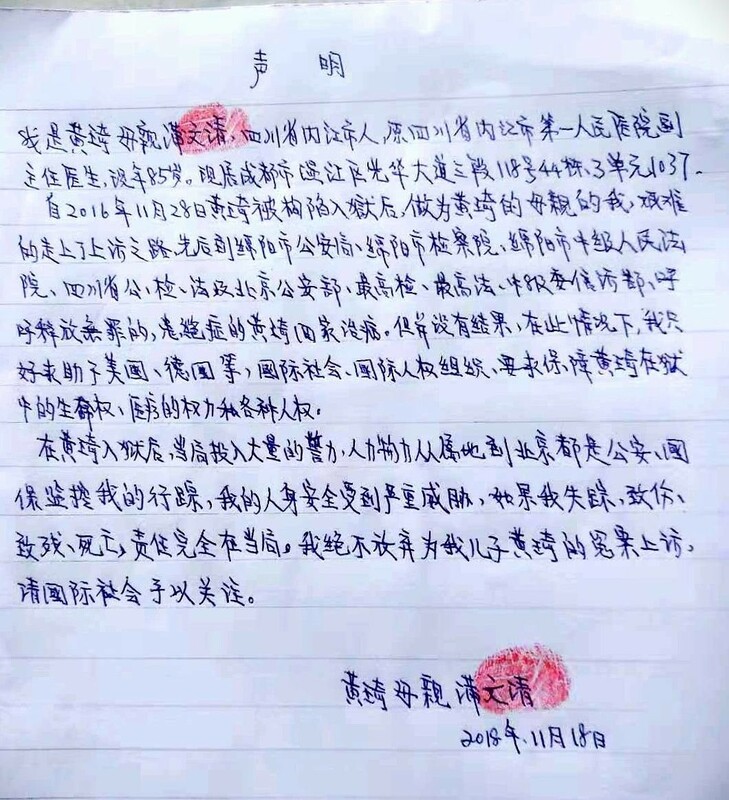 In a statement authenticated by her thumbprint, Pu Wenqing (蒲文清), 85, mother of Huang Qi (黄琦), the Sichuan rights activist in prolonged detention, says that the authorities have deployed large amounts of resources to monitor her as she petitions for justice for her son. She says if she is missing, injured, disabled, or dead, the authorities should bear the whole responsibility. She reiterates that she will never give up petitioning for Huang Qi, who has been held without trial for nearly two years. Pu says that since Huang Qi was first detained on November 28, 2016, she has gone to all relevant government departments—the police, procuratorate, and the court—at the municipal, provincial, and central levels, to call for the release of Huang Qi, who is innocent and seriously ill, so that he may receive proper medical treatment. As there has been no result, she is now calling on the international community to help ensure the protection of Huang Qi’s basic human rights, including the right to life and to medical care in prison. Huang Qi was indicted in January 2018, after more than a year in detention, on charges of “illegally providing state secrets abroad.” But the authorities have not yet brought him to trial. I am Pu Wenqing (蒲文清), Huang Qi's mother, a native of Neijiang City, Sichuan province, and a former deputy chief doctor at the No. 1 People's Hospital of Neijiang. I am 85 years old and currently live at 118 Guanghua Avenue, Section 3, Building 44, Unit 3, Room 1037, Wenjiang District, Chengdu. the petitioning department of the Central Commission for Discipline Inspection of the Communist Party of China. I have called for the release of Huang Qi, who is innocent and seriously ill, so that he may receive medical treatment at home. But there has been no result. Under this circumstance, I can only resort to seeking help from the international community, such as the United States and Germany, and from international human rights organizations, to ensure Huang Qi’s right to life, right to medical treatment, and right to protection of his various human rights in prison. After Huang Qi was put in prison, the authorities have put in large amounts of police force, manpower, and material resources, to follow me in my hometown area to Beijing. Everywhere I turn, I am under surveillance by public security and domestic security agents, who seriously threaten my personal safety. If I am missing, injured, disabled, or dead, the entire responsibility should be borne by the authorities. I will never give up petitioning for my son Huang Qi, who is the victim of the miscarriage of justice. I appeal to the international community to pay close attention.